6. For the compote, bring the ingredients to a simmer in a pan. Cook, uncovered, for 5-7 minutes, until jammy and the berries have collapsed. Mash well and leave to cool. 7. For the cheesecake cream, beat the ingredients for a few seconds, until smooth. Chill both. 8. To cook the doughnuts, fill a large, deep, heavy pan ⅓ full with oil (or use a deep-fat fryer) and heat to 180˚C. Line a few trays with kitchen paper. Fry the doughnuts 2-3 at a time for 2 minutes on each side, or until deep golden with a pale ring around the middle. Using metal tongs, transfer onto the kitchen paper to drain. For the coating, put the sugar in a shallow container. Toss the doughnuts to coat; cool. 9. Put a large 1cm piping nozzle into a piping bag; fill with the compote. 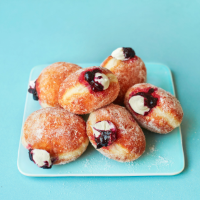 Poke a hole in each doughnut using the handle of a teaspoon or wooden spoon; pipe compote into each. Clean the bag and nozzle, then pipe the cream into the same hole until the doughnuts feel plump.